Nathan has been making national headlines on FOX & CNN. He will be reciting the Constitution from memory at the National Archives in Washington D.C. on Constitution Day – 9/17/2016! "Knowing and understanding the freedoms guaranteed by our United States Constitution are essential to the preservation of our republic. 'Constitution Quest' is a game for all times. It is an easy-to-play, exciting adventure into one of our most precious national treasures. This game is a winner!" - Robert W. Sweet, Jr.
"The game can be played with as few as two people, but becomes an engaging constitutional party when you partner up into teams. 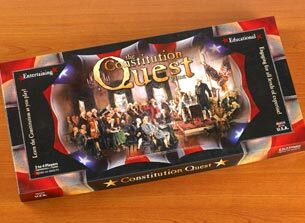 However, Constitution Quest is not for students alone; the entire family will love to play this game. The fun starts before you even begin playing: Choose your game piece from 10 of the 39 signers of the Constitution. This is a great learning opportunity for everyone to learn more about the founders of our country. Try it on Family Game Night, or at your next celebration for the Fourth of July or another appropriate holiday. Students of basic government, average adults, even that one guy you know who is a civics genius – everyone will love exploring our U.S. Constitution in this fun game." 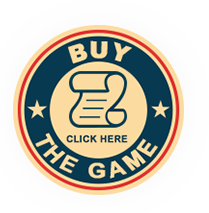 "Players will certainly become much more familiar with the U.S. Constitution by playing this game. While that makes it a fabulous tool to use in conjunction with a Government course, it is still enjoyable for play outside of a course. I played with adults one evening just for fun. All agreed that it was a great game. Some might be reluctant to play since it’s been years since they’ve read the Constitution. However, the chance elements built into the game dilute the natural advantage some players might have with prior knowledge. In fact, our first game was won by the person who probably was rustiest on her Constitutional knowledge! –Cathy Duffy Reviews"
"The great thing is that you do not have to be a history whiz to win because the point of The Constitution Quest Game is to learn as you play. 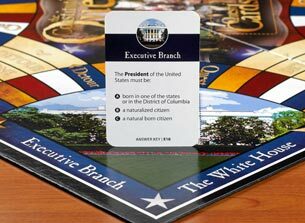 The game comes with 223 game cards, separated into five card deck categories; The Executive Branch, The Legislative Branch, The Judicial Branch, Founders & Facts, and the Quest Cards. The game cards cover content that players read aloud to each other in a test-taking multiple-choice format with various answer choices (except for the Quest cards which are true/false questions). They also integrated the element of chance to heighten the excitement while reinforcing the game. 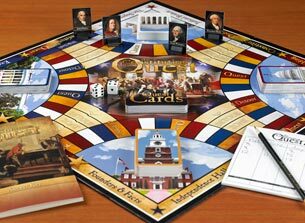 The game comes with an answer key, dice, and a scoring pad, but the treasure for any history buff will be the copy of the Constitution and Declaration of Independence that is included. For 2 to 10 players, you can even partner up, making the game more intense and fun. " "Are you and your family game players like we are? If so, I have a recommendation for you that needs to be put at the top of the list! 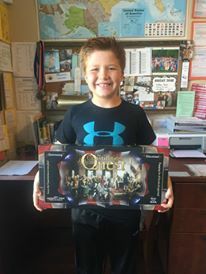 We received this gorgeous box from Pam and David Barrett with Constitution Quest, with rich colors and high quality materials, and I squealed when I got it open! I am a HUGE sucker for a good educational game, but this one surpassed my expectations before even sitting down to play it! I could tell right off the bat that we were going to wear this one out." "From the first roll of the dice... we were honestly hooked! Get in the Game: It's Constitution Day! "The more people who know the Constitution, the better our country will be... It was the blueprint to our greatness, and I think sometimes we take it for granted and have let it get dusty. Now is the time to wipe it clean and shine the light on it." "Constitution Quest; you'll love that game! If you are a teacher, especially of American history or government, or 7th and 8th graders who are doing that trip to D.C...this may be the best preparation ever!